Do you think that a death certificate is just another piece of bureaucratic paperwork you have to take care of? Think again. While it might seem like it’s just one more hassle during an incredibly difficult time for you and your family, the reality is a death certificate is a crucial document to have, especially if you’re an estate executor. Let’s find out why, and how to go about getting one. 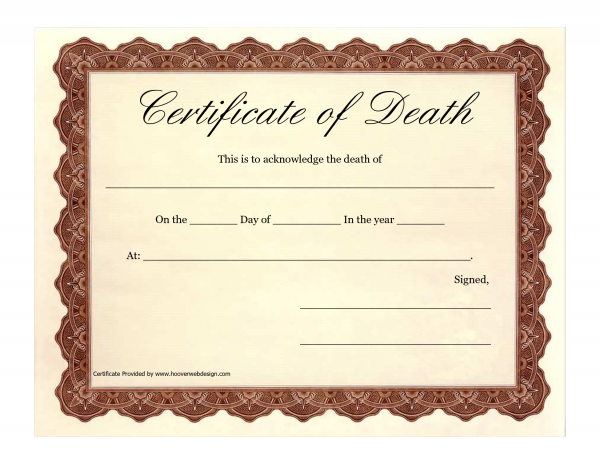 Put quite simply, a death certificate proves that someone has died. While it might seem crazy that you need to prove that a loved one has passed away, think about all of the ways people could use their death to get out of obligations. Between tax and debt evasion alone, there are a whole host of reasons why someone might want to pass off as dead. Or, on the flip side, ill-meaning individuals can take advantage of someone’s estate if all they have to do is claim a person has died. Thanks to death certificates, authorities can be reasonably assured that an individual has truly passed and steps can be taken to liquidate an estate. On a more day-to-day level, there is a standard reason that death certificates are issued: they are necessary for someone to be appointed as your estate executor. Estate executors are intrusted with dispersing your estate and following your last will’s wishes, which means making sure your debts are paid off and your beneficiaries receive their inheritance. A big piece of this is getting in touch with assorted parties like financial institutions, insurance companies, the social security administration, and the Veterans Administration (if applicable) and closing your accounts, paying outstanding bills, and accessing your assets. These institutions will not speak with you unless they have proof that the individual has died and that you are entrusted with their estate. As you can guess, the death certificate is the vital proof you need that your loved one has died, and opens the door for executors to complete their responsibilities. Many people today have digital accounts with a whole host of providers. Think Facebook, Google, Amazon, and even online dating sites. When a loved one dies you’ll likely want to close these accounts. Sometimes it’s to stop digital notices, other times it’s to ensure no future charges are made to your loved one’s bank or credit card accounts. Just like financial institutions, many of these digital institutions require a death certificate to prove the account holder has died. Don’t believe us? Just read these past articles on closing a Facebook or a Google account. Sure enough, these major sites want to see a death certificate before they even speak with you. As we wrote about in more detail, the actual responsibility of filing for a death certificate is generally in the hands of the person preparing the body like a funeral director or crematory. It is just as easy to request one death certificate as it is to request twenty. Or, you can always try VitalChek and have them get it for you. Now that you see how many different institutions will want to see one, you can understand why you’re better off asking for more right off the bat. With a whole bunch handy, you can more easily cross of your estate executor to-do list. Previous PostPrevious Philosophy of Everyday Life: What are the lessons people most often learn too late in life?